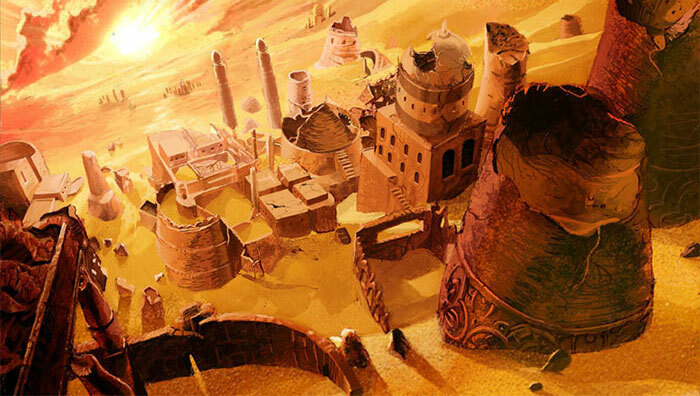 Far over the city towered the great Roman dome of the new museum; and beyond it—across the cryptic yellow Nile that is the mother of aeons and dynasties—lurked the menacing sands of the Libyan Desert, undulant and iridescent and evil with older arcana. Anyone who has ever explored Egypt, read about her, or merely looked at pictures of the Great Pyramids knows that the country has deep, dark, and ancient secrets. Greek historians, Islamic scholars, Hungarian noblemen, and Napoleon himself have all sought to solve the mysteries of Egypt’s massive tombs, ruined temples, and drifting sands. 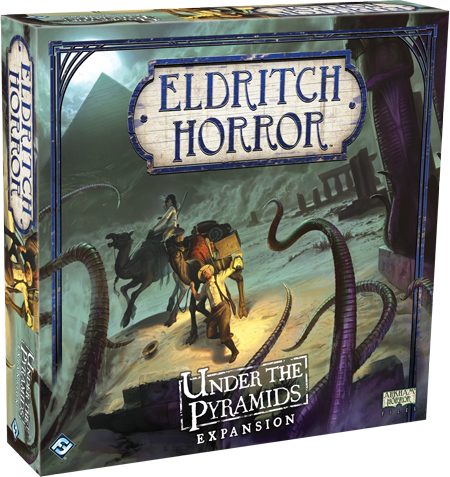 In the Under the Pyramids expansion for Eldritch Horror, solving those mysteries is more important than ever. The fate of the known world depends on it. 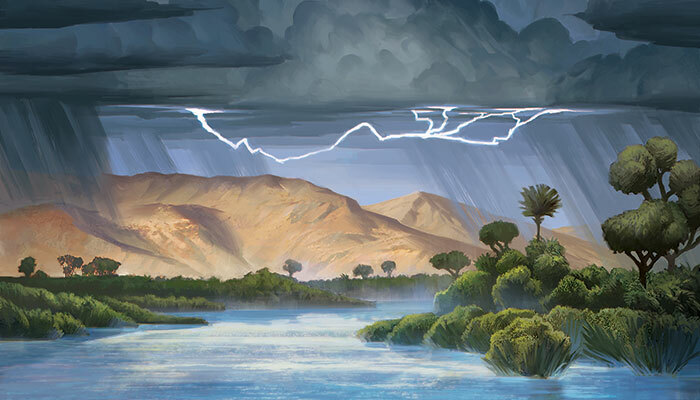 Herodotus christened Egypt the “Gift of the Nile,” for all living things in Egypt depend on that broad river’s waters. 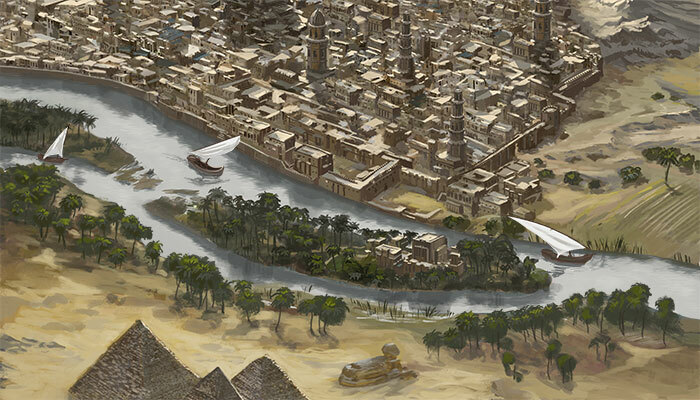 Cairo, Alexandria, Tel El-Amarna, and Giza are all within sight of the Nile. Even the timeless and secret trade routes across the Sahara reach toward it. 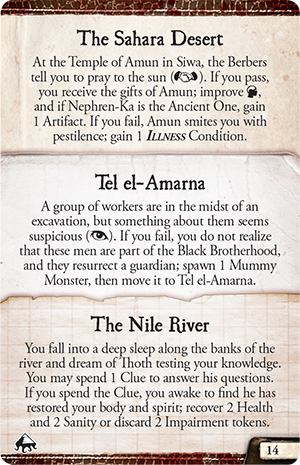 In today’s preview, we explore the Gift of the Nile and unearth a scant few of the myriad ancient horrors that dwell throughout it. In Under the Pyramids you can enter Egypt as humans have since the dawn of our species: by traveling north from the Heart of Africa along the Nile. This southernmost region of Egypt was once known as the Land of Reeds: for millennia the Nile’s seasonal flooding created broad marshes. Now the Aswan Dam keeps the river in check, and wealthy tourists float upon the calm water in expensive barges. 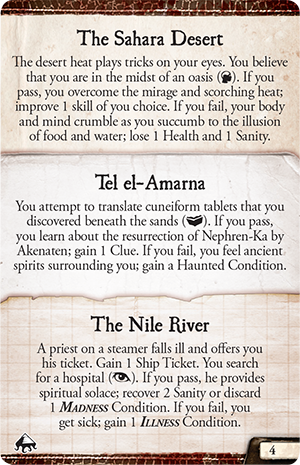 A visit to the Nile may help you recover from any physical and mental wounds you’ve suffered. Helping an ill priest on your boat could both give you a free ship ticket and restore your sanity, even if you are suffering from a dire form of madness. You might, however, end up contracting his illness. Sleeping on the riverbank may draw the attention of Thoth, god of learning and writing, who will test your knowledge in your dreams and heal you if you pass. Continuing up the Nile by steamer will bring you to Tel El-Amarna, the sandblasted ruins of Akhenaten’s capital city. Akhenaten was the only pharoah to abandon worship of traditional Egyptian deities like Isis, Osiris, Bastet and Thoth, in favor of worshipping only one god, Aten, the sun. Soon after his reign, however, both god and city were abandoned. Tel El-Amarna is now inhabited only by ghosts, mummies, ghouls , and Egyptologists , but they may provide you clues to your mysteries. 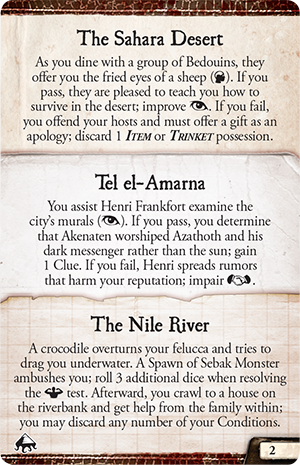 Failing to win the favor of an Egyptologist impairs your influence; failing to win the favor of a ghoul endangers your health. From Tel El-Amarna you can travel north, past Giza’s Great Pyramids and watchful sphinx, to both Cairo and Alexandra. Indeed, Giza is almost within Cairo's boundaries—Egypt's capital has been Egypt’s greatest, most cosmopolitan city since the earliest Pharaonic dynasties. That is no less true now in the 1920s. In this “city of a thousand minarets,” the streets are filled with not only Arabs and Egyptians, but Berber traders, German archeologists, Ethiopian businessmen, British imperial officers, and American tourists. 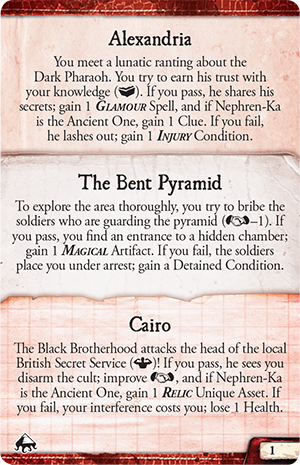 Helping a member of the British Secret Service to fight off an assault could earn you improved influence and a Relic from a recent excavation, like a Pharaonic mask . 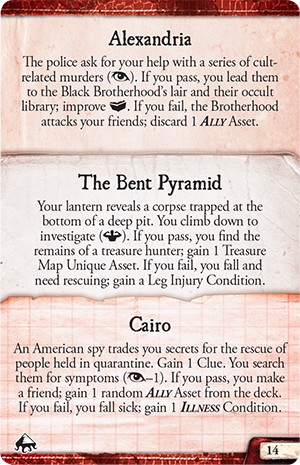 Rescuing a group of Americans held in quarantine could gain you a grateful Ally to accompany you on your adventures. Alexandria is at least two thousands years younger than Cairo, a cultural center bordered by the Sahara and Mediterranean. When Alexander the Great founded it he established an immense library to hold all the world’s books and a towering lighthouse to guide sailors to shore. The lighthouse has fallen, its stone assimilated into newer buildings or resting on the Mediterranean floor, and the library’s scrolls have been either concealed or burnt. 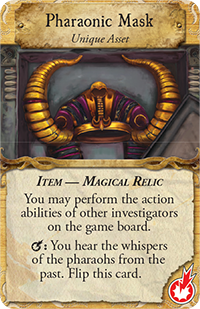 You might still come upon a scrap of papyrus detailing arcane knowledge or a wandering magician schooled in mystical lore. Alexandria is the best place to acquire Glamour spells, which provide benefits that endure as long as you can maintain the spell. 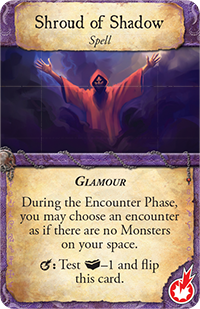 Shroud of Shadow , for instance, prevents monsters from detecting your presence. 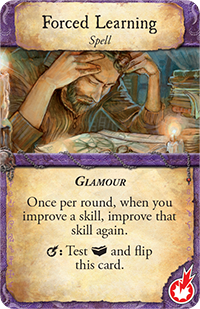 With the Forced Learning spell, popular long ago among Alexandria’s hardworking librarians, whenever you improve a skill, you automatically improve that skill again. Alexandra also serves as a gateway to the vast, forbidding Sahara. Beyond the nomads who have spent their lives navigating from oasis to oasis, only the most determined travelers dare enter the desert. 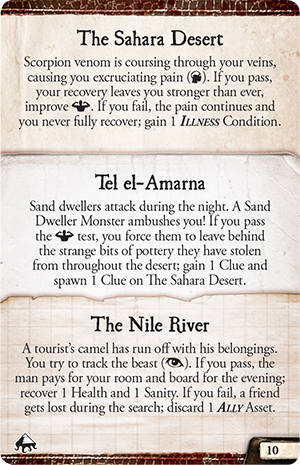 Yet, if you can survive the horrors within infinite sands, you will emerge from the Sahara with better skills than you had before. Willing yourself through the pain of a scorpion sting , for example, improves your strength. 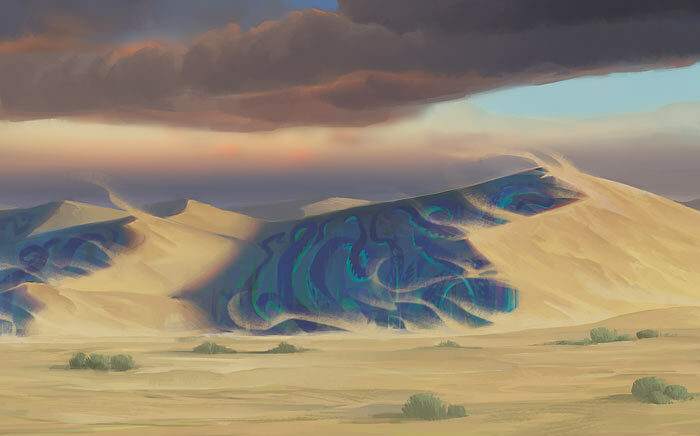 There have always been rumors of mysterious wonders within the desert. Some say they have found ancient glyphs of swimming figures. Others speak of glass castles standing near bright blue oases. For centuries, stories have also been told of a lost white city, Zerzura, filled with lush gardens, ornate castles, delicious foods, and deep pools. There is a chance that you could find Zerzura , but no luxuries await you there, only a Relic to help you in your struggle against the Ancient Ones. No less legendary or dangerous, but much closer to the Nile than Zerzura, is the Bent Pyramid where the Dark Pharaoh is said to rest. There you may find an Artifact, like the scales that Thoth used to weigh the hearts of the dead against feathers. The lightless sandstone corridors could possibly lead you far into the past, to the days of the Dark Pharaoh’s reign. He may offer you a bargain that could save humanity or cause you terrible pain. Or both. 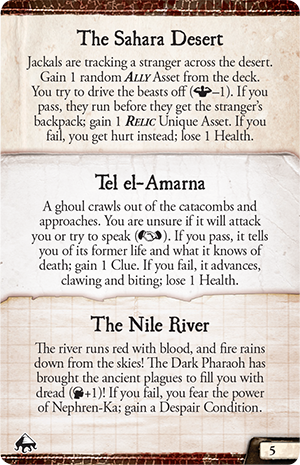 Discover what dead things are coming alive in Egypt. 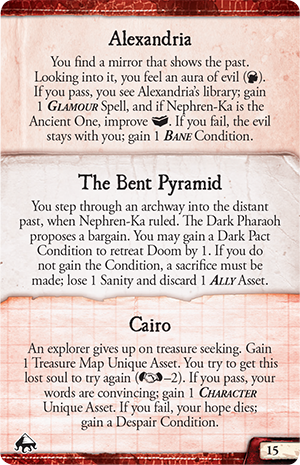 Pre-order Under the Pyramids from your local retailer today! The end draws near! Do you have the courage to prevent global destruction? 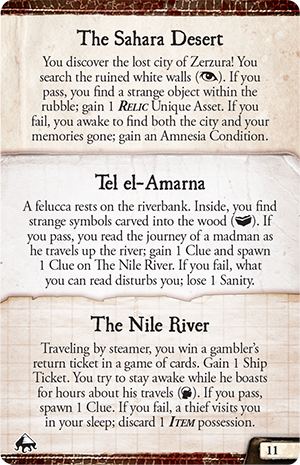 Eldritch Horror is a cooperative game of terror and adventure in which one to eight players take the roles of globetrotting investigators working to solve mysteries, gather clues, and protect the world from an Ancient One - an elder being intent on destroying our world.